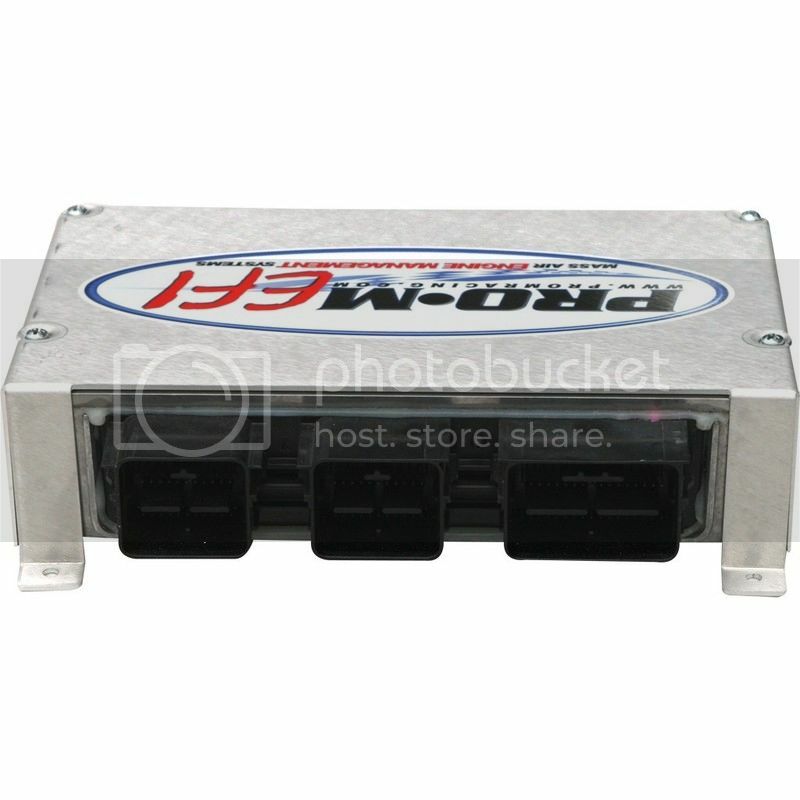 Im curious if anyone has any experience with the PRO-M EFI ECU. Looking at there website, there are several clues that makes it seem like they are just using OEM Ford Computers for the Coyote Engines, just like they did with there older version of the EFI system using A9L computers. But watching a video they posted of an install into a fox body mustang, they said that the TFI module is used to provide cam and crank signals, but isnt used for ignition. I was aware that the pip signal generated by the TFI would give a cam signal, but not a crank. They dont install any kind of pickup wheel on the crank, so how would this work, or is this truly a ECU of there design built in the same plant and calibrated by Ford employees? If they are just Ford computers, then conseveably we could just do the same thing they are doing, for alot less money. The interrupter wheel in the dist has one opening that is a different size. That one is used to find number one cylinder so no crank sensor is needed. The dist only spins half the speed of the crank so each time that window is seen means number one cyl I ready for spark again. Vehicle Information: 86 GT, stock block, twisted wedge heads, Anderson N41 cam, cobra intake, 180 shot, 3.73 gears, T-5 trans, 24# injectors, 155Lph fuel pump, 73mm C&L mass air meter, moates QH tuned by Decipha, Mac 1 5/8 shorty headers, Flowmaster 2 chambers, Drag radials, South Side control arms circa 1999. I've been doing some research and it looks like the crank wheel is a standard 36-1 wheel on the coyote. But the cam sensors on the coyote are quite a bit different. they look like they are unevenly spaced with a missing tooth. this looks like it could be copied and produced into a shutter wheel to install into the factory distributor. So in theory you could install a 36-1 wheel on the crank and manufacture or modify the shutter wheel to match the coyote cam wheel and use the later model coyote computer. To be honest. Now you lost me. Is was referring to 86-93 5.0. But same ideas may be at work somehow. The new Pro-M racing EFI system is based on what looks like to be the new coyote PCM due to it having dual wideband support, and the following from there website, "Production quality processor! The Pro-M EFI processor is made by the same manufacturer who makes the processors for Ford." "Furthermore, the software and code is written by OEM contractors. This entire project was a collaboration between Pro-M Racing, and the finest people in the OEM world." In a video they install there system into a fox body mustang, they say that the TFI module is only used to provide cam and crank position to the computer, but do not install a crank position sensor or change the shutter wheel inside the distributor. 1. Is there new system basically a coyote ford computer in a shiny new box, just like there previous generation of EFI systems were just A9L computers? 2. If they are using just factory ECUs, how are they dealing with the lack of a crank sensor. Since according to the video, the TFI provides both the cam and crank signals for there system to work. 3. If it truly is a custom computer, then would we be able to accomplish something similar using the Ford computer by adding a 36-1 crank wheel and a custom shutter wheel inside the distributor?